The iSound Fire Glow rechargeable portable speaker packs crystal clear sound and surprisingly powerful bass into a portable, compact and very attractive aluminum casing design. Simply plug your iPod, iPhone, iPad, smartphone, laptop, MP3 player or other audio device into the 3.5mm audio cable to bring your tunes anywhere. The iSound Fire Glow speaker comes with an expandable design for improved sound quality. 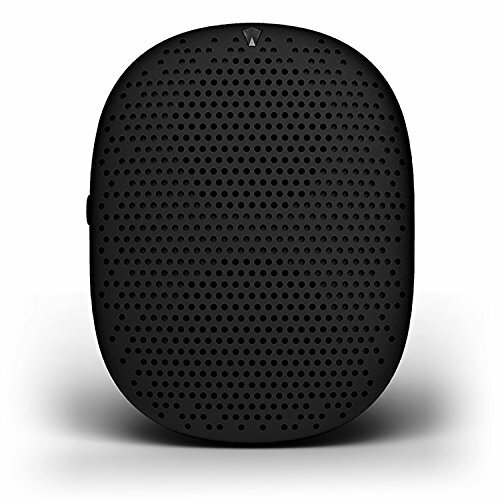 The speaker features a Li-ion Polymer Battery which allows 5 hours of playtime at 70% volume and 40 hours of standby time. Included with the speaker is a 3.5mm audio cable as well as a USB cable for quickly recharging the built-in rechargeable battery, a full charge taking less than 3 hours. Impress yourself and others with the crystal clear sound and colorful light effects of iSound's Fire Glow. Think outside the box! This wireless speaker offers a new twist (literally!) on great sound for your entertainment devices. 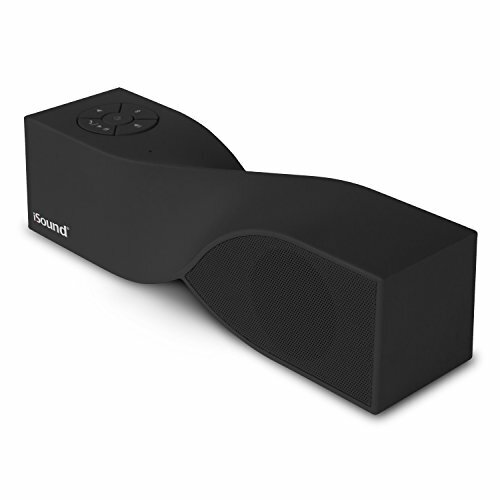 The iSound Twist Speaker is Bluetooth enabled so you can wirelessly stream music from your Bluetooth enabled tablet, smartphone, MP3 player or computer from up to 30 feet away. This speaker also features a built-in microphone with advanced noise cancellation to allow clear hands-free calling as well as a dedicated volume control button. The Twist is powered by a built-in rechargeable Lithium-Ion battery and offers up to 5 hours of continuous playtime depending on volume. While this device is Bluetooth enabled it also works with any device that has a 3.5mm audio plug such as MP3 players, iPods, iPads, iPhones, Android phones, Blackberry and tablets. 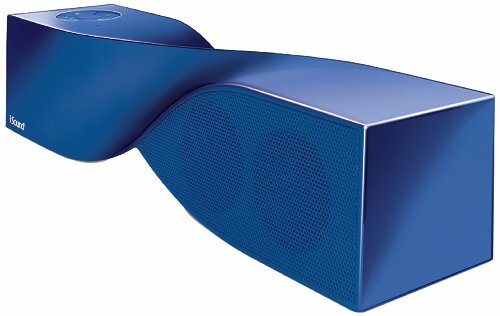 Two speakers and a passive subwoofer will provide impressive sound while the device itself is an absolute eye catcher that comes in 9 different colors to match your style! 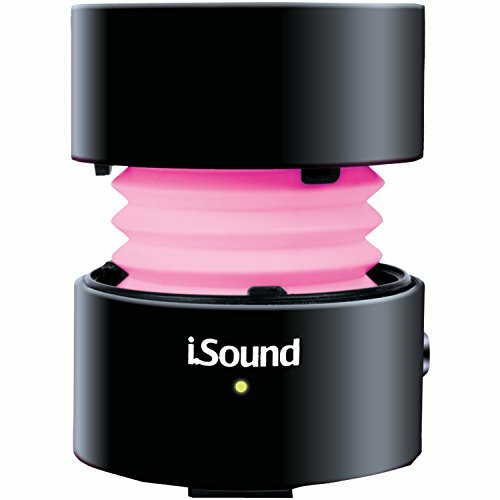 Enjoy great sound with a twist with the iSound Twist Speaker! The iSound Fire wired, rechargeable speaker packs crystal clear sound and surprisingly powerful bass into a portable, compact and very attractive aluminum casing design. Simply plug your iPod, iPhone, iPad, smartphone, laptop, MP3 player or other audio device into the 3.5mm audio cable to bring your tunes anywhere. 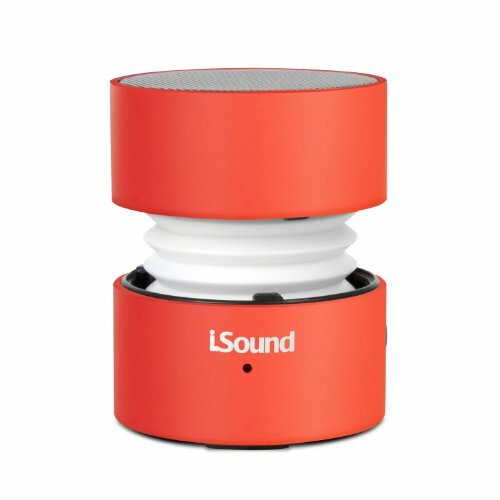 The iSound Fire speaker comes in many eye catching colors and with an expandable design for improved sound quality. 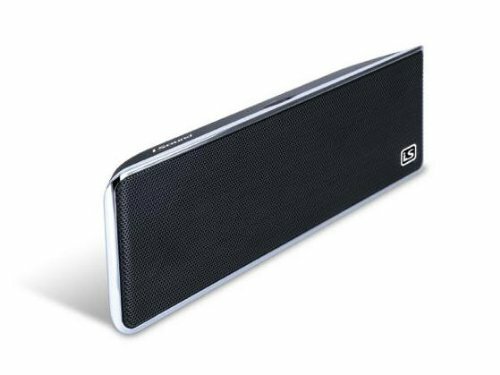 The speaker features a Li-ion Polymer Battery which allows up to 5 hours of playtime at 70% volume and 40 hours of standby time. Included with the speaker is a 3.5mm audio cable as well as a USB cable for quickly recharging the built-in rechargeable battery, a full charge taking less than 3 hours. Impress yourself and others with the crystal clear sound and the cute style of the iSound Fire speaker. 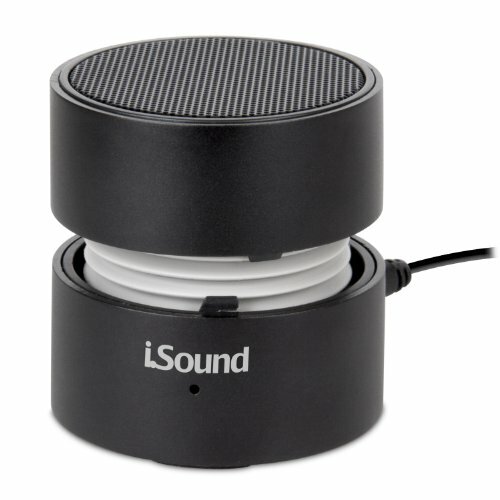 Take your music anywhere with the Mini Speaker from iSound. Experience rich bass and crystal clear treble from a speaker small enough to fit in your pocket. Take your music to-go, with the Mini Speaker. 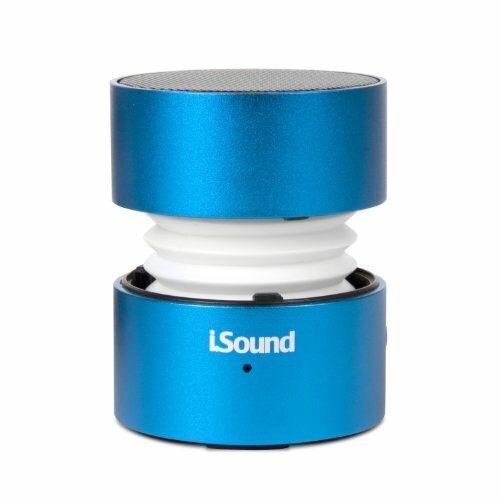 The iSound GoSonic speaker delivers crystal clear sound from your audio device in a small and highly portable design powered by a built-in rechargeable battery. Connect the GoSonic with your audio playing device via the included 3.5mm audio cable and enjoy your favorite tunes for 2.5h hours or more depending on volume. 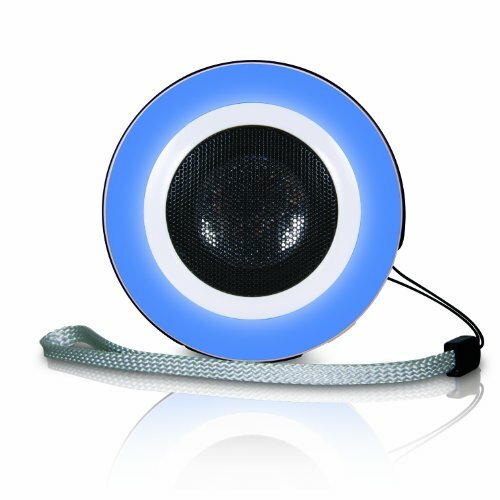 The speaker recharges back to full power quickly within 3 hours using the also included mini USB cable. The GoSonic is the perfect speaker to enjoy your audio anywhere. Take it to your office, campsite, yard, beach, gym or use it at home! TWIST Mini Bluetooth Speaker and Speakerphone. 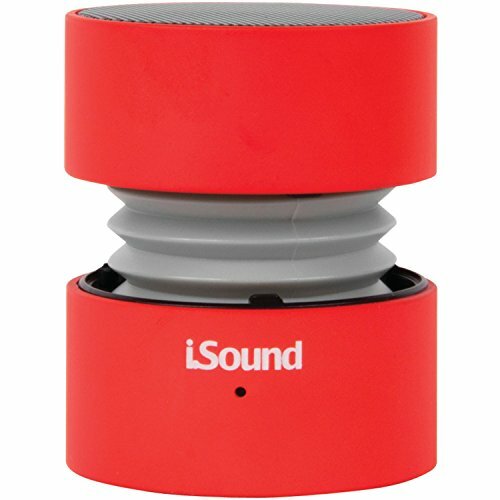 Compare prices on Isound Portable Speaker at ShoppinGent.com – use promo codes and coupons for best offers and deals. Start smart buying with ShoppinGent.com right now and choose your golden price on every purchase.